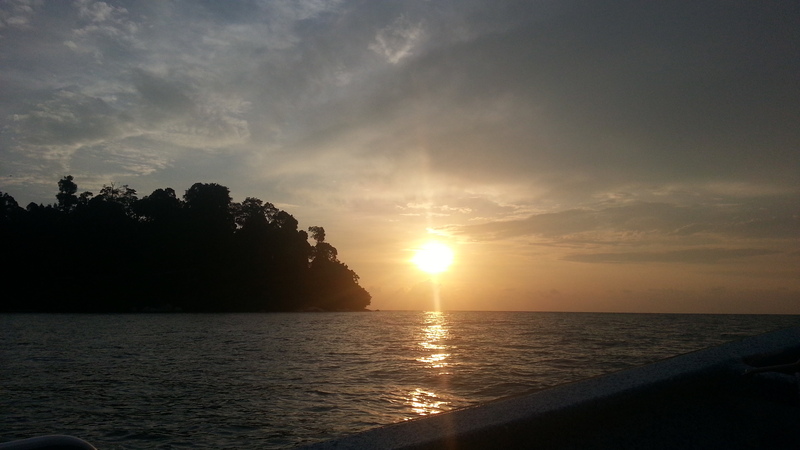 The history of Pangkor Island began as a refuge for fishermen, pirates and merchants in the 17th century. With the arrival of the British back then, you would expect to see some footprints of the British colonization. 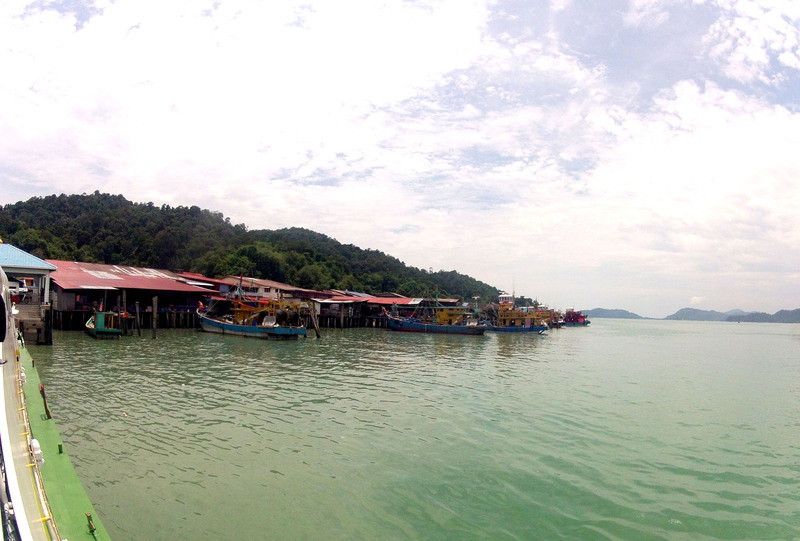 However, the villagers of Pangkor managed to preserve a huge part of their beautiful archipelago and culture. And that’s not all. Pangkor is internationally known for the award-winning Pangkor Laut Resort which is owned by YTL Corporation and not forgetting the ever-magnificent Emerald Bay. Emerald Bay is positioned in such a way that guests will always be able to face the sunset in clear view while relaxing by the beach. 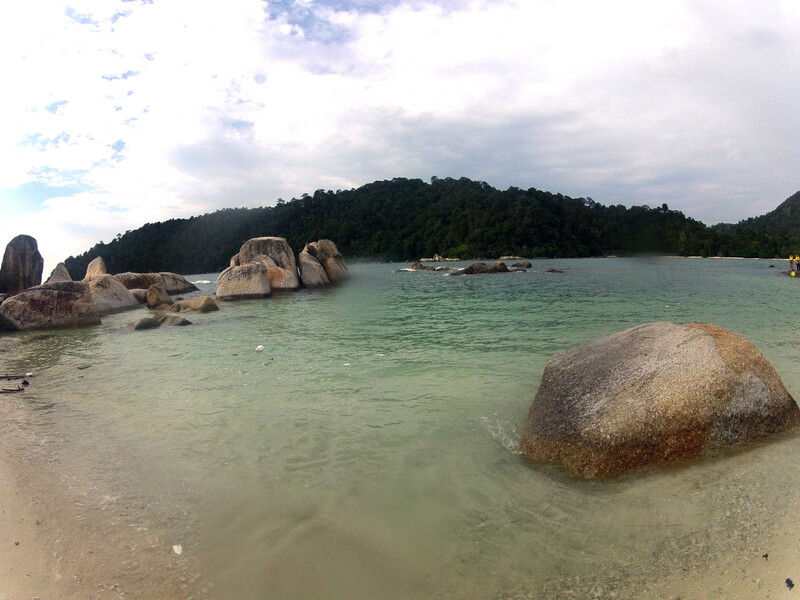 Important fact to note before you read further: Pangkor Island is NOT Pangkor Laut. These islands are two seperate entities. However, they are situated opposite of each other. Pangkor Island is where beach-goers and locals would go for a weekend getaway, nice seafood and lots of water activities. Pangkor Laut is where the rich with super deep pockets would go to for a weekend getaway via helicopter or private boat, nice $200 per plate seafood and endulge in spa activities. You get the drift? The exclusive Pangkor Laut Resort has won numerous awards like No. 1 In The World in Conde Nast Traveller UK’s Top 100 list. It is fairly easy to get to. Like me, if you’re coming from Singapore, it will take you 12 hours by bus. First and foremost, THE MAP. 1) Take a direct overnight bus from Singapore to Lumut Town. You can book the bus tickets online from www.easibook.com. Buses leave from two main areas: Golden Mile Complex or Keypoint. However, I believe that there are various collection points elsewhere. As it was a last minute decision for me and considering its public holiday, all the direct buses were sold out. 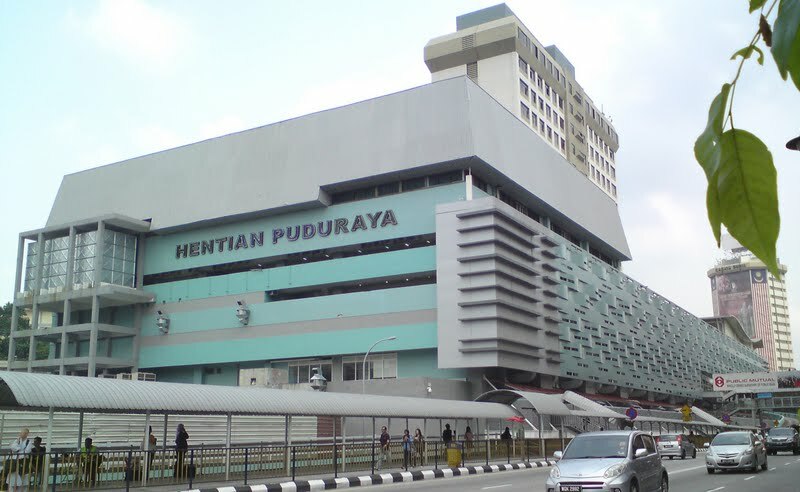 Alternatively, you could take a bus from Singapore to Kuala Lumpur (KL Puduraya Bus Terminal) and then from Puduraya, take the Plusliner bus (or any other buses) to Lumut Town. 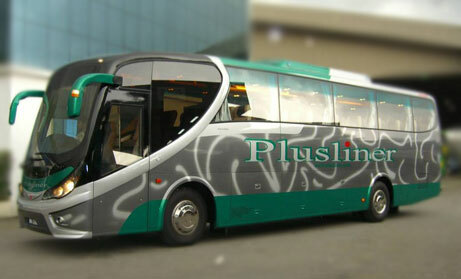 I prefer to take Plusliner as its cheap and comfortable. We took the 0830am Plusliner bus from KL Puduraya bus terminal which costs RM$27.50 (USD8). Journey to Lumut bus station takes 4 hours. Traveller advice: Please note that Lumut bus station is the last stop. I noticed that some clueless tourists would alight at the 2nd last bus stop which is Manjung Bus Terminal. If you don’t see any sea or jetty nearby, don’t alight, people! Why stop at Lumut Town? Traveller Note: Lumut Bus Station is located at Jalan Haji Muda. Plusliner’s earliest bus is at 8am from Lumut to KL. Bus counter opens at 7am. 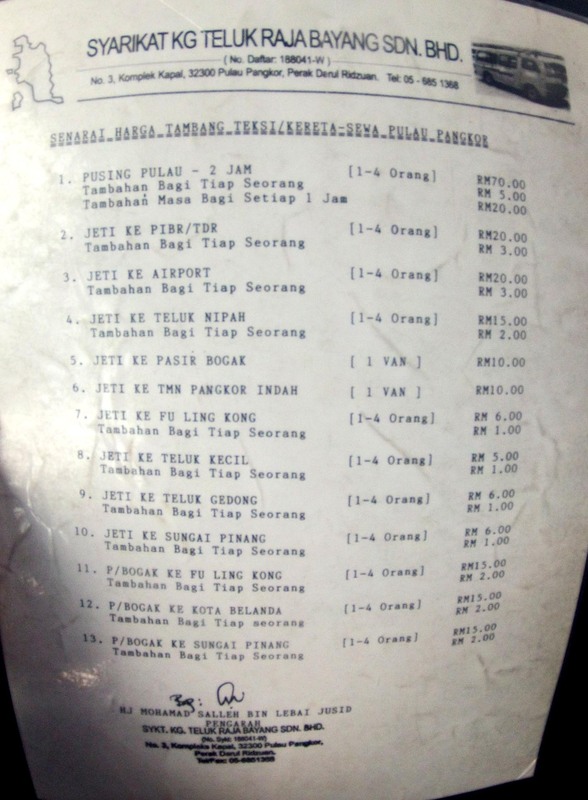 Bus to KL (Puduraya) cost RM27.50. 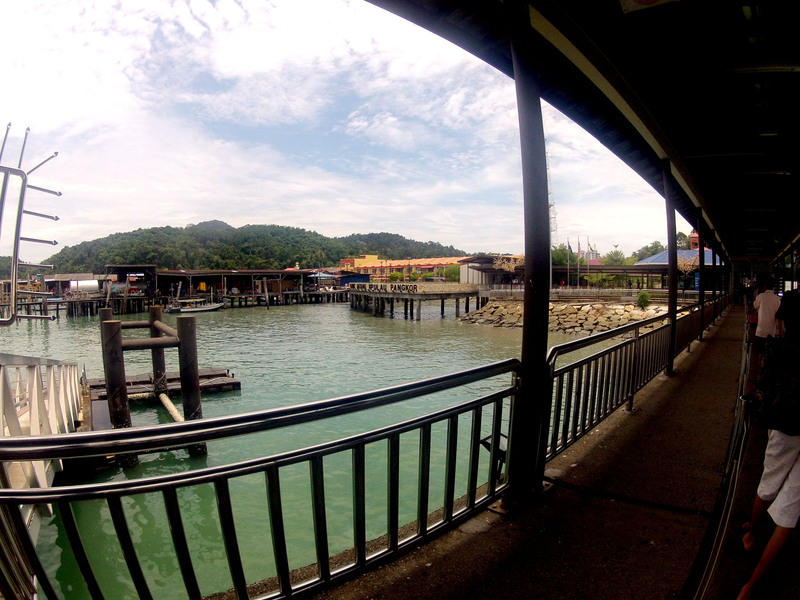 Lumut town is the gateway to Pangkor Island and Pangkor Laut Island. Walk pass a big outdoor carpark next to the bus station, cross the road and you’ll see the ferry centre where you can buy the tickets. 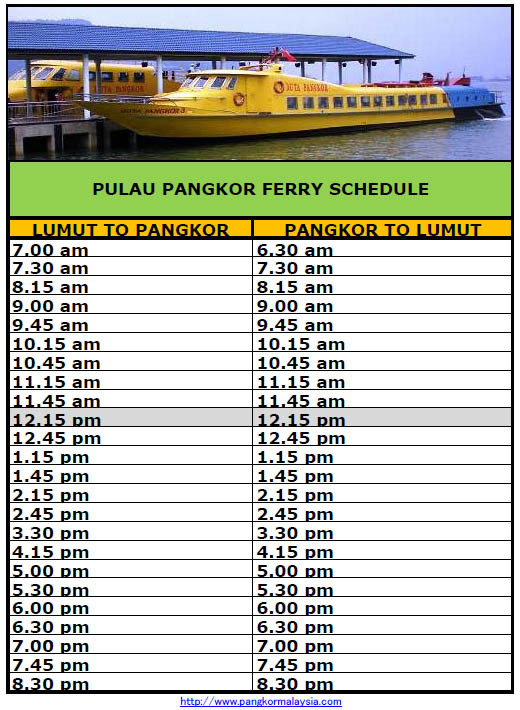 ferry to Pangkor Island is at RM10 (USD3) per pax for return tickets (RM5/one way). 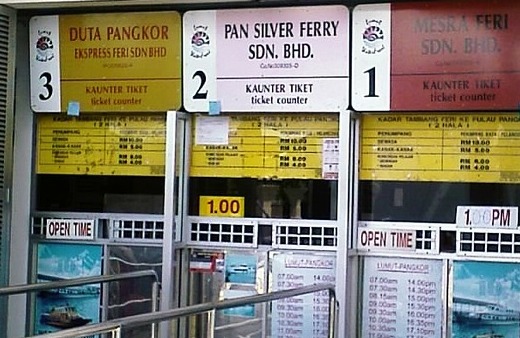 Ferry ticketing office at Lumut. Located just outside the jetty. Traveller tip: Buy the return trip instead of a one way trip should you decide to return with the first ferry at 0630am. Ticketing office at Pangkor Island only opens at 8am. The ferry will have two stops. The first stop will be at the fisherman’s village. This is where locals would normally alight. Not much to see generally unless you wish to see how the fishermen do their daily routine. 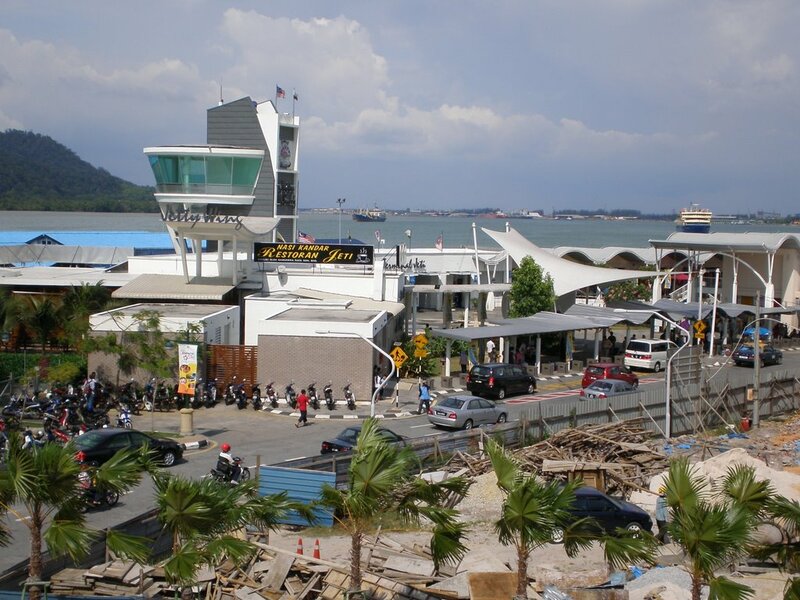 The nicer resorts, chalets and beaches will be at the second ferry stop, Pangkor Town Jetty. 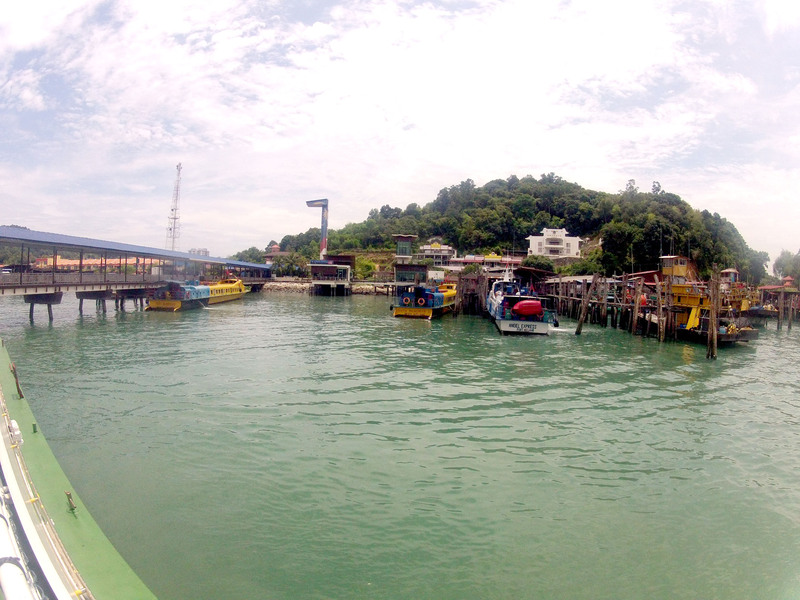 The second ferry stop is at the Pangkor Town. Once you alight from the ferry, you will be greeted with a group of men trying to sell you motorbike and car rentals, hotel rooms and tours. Fret not, they are not pushy. Just walk pass them and you will see the taxi area. 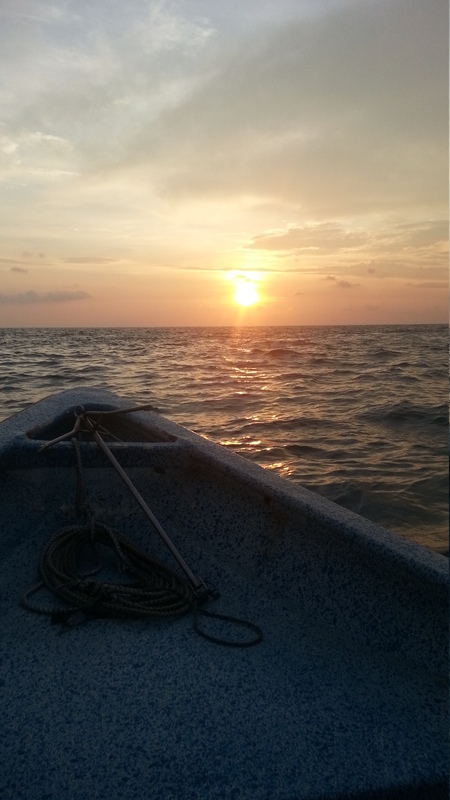 The three best places to stay are at Nipah Bay (Teluk Nipah), Coral Bay and Pasir Bogak. If you are on a budget but still require all the basic necessities like clean bedsheets, towel, toiletries, you would want to consider Budget Beach Resort at Nipah Bay. 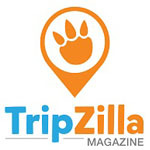 Highly recommended by Tripadvisor and Agoda. Rooms are priced from RM75 (USD23)/night for a standard room for 2pax. Budget Beach Resort has a laid back atmosphere. 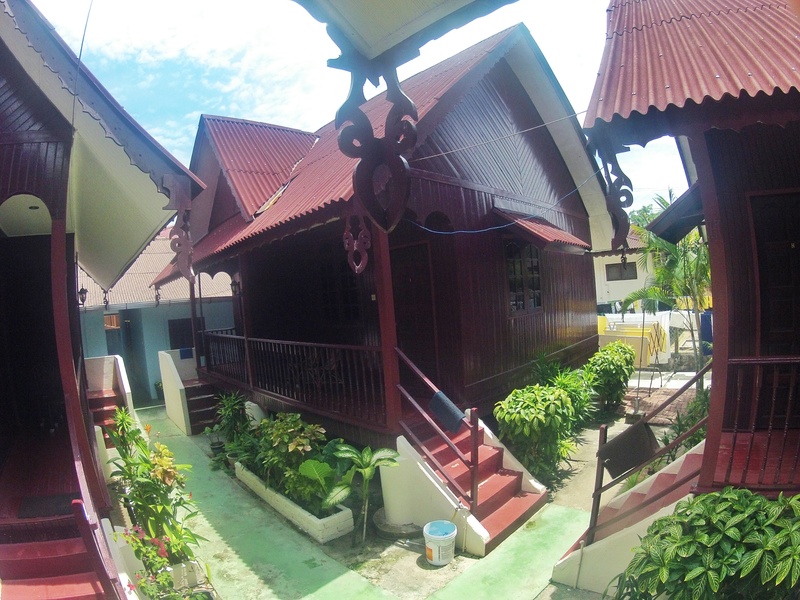 Each chalet has a traditional Kelantan architecture. Rooms are clean, fast WIFI…well, I’ll leave you to read the rest of the reviews on Agoda. Nipah Bay is the most vibrant part of the island with alot of watersport activities and boat tours to choose from. After you oogle at the beautiful sunset, please help yourself to the array of wide choices of seafood along the streets of Nipah Bay. Traveller advice: For a boat tour around the small islands with snorkelling included at Giam Island, please don’t pay any more than RM 15 (USD 4.60). Coral Bay is my favourite secret beach in the whole island. It has the cleanest and prettiest beach also as voted by Tripadvisor. Another plus points given to the fact that Coral Bay is uncrowded. So if you want to seek a peaceful retreat, head to Coral Bay. It is located just 5-7 mins walking distance from Nipah. You would have to walk along the side of the road to get to Coral. Traveller Tip: Because everybody else will be flocking to Nipah to catch the sunset, you would want to consider heading to Coral Bay for a quiet and peaceful sunset moment. You will have the whole of the beach to yourself, to catch the sunset. 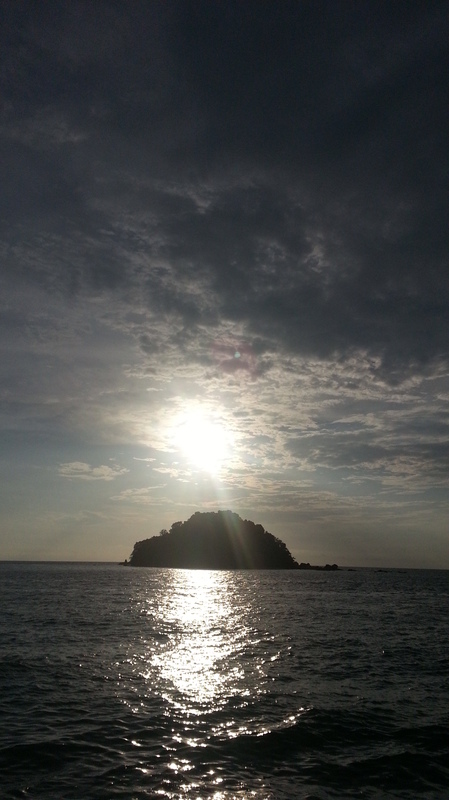 I did not bring my camera with me to snap some shots of the planktons at Pasir Bogak. However, just for your reference, this is what the blue planktons at Maldives looks like. Cool huh? 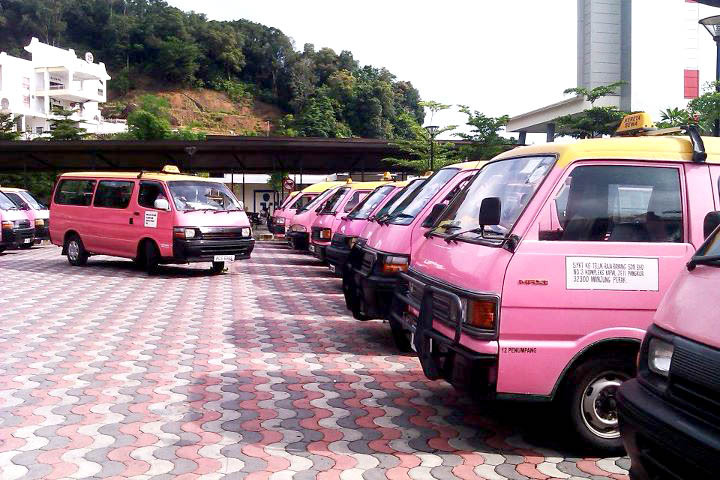 To get to Pasir Bogak beach, you have to take the pink taxi or if you’re up for it, you can walk from Pangkor Jetty. But that’s going to take you around 20-25 mins. 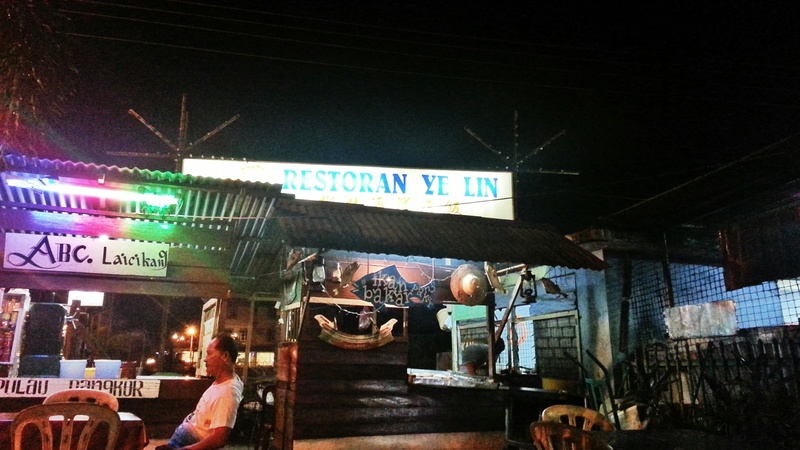 1) Skip all the other overpriced seafood joints on Pangkor and head to Restaurant Ye Lin. You’ll get value for money seafood which is oh-so-fresh and mouth-watering. No kidding. Have I mentioned that it’s cheap? 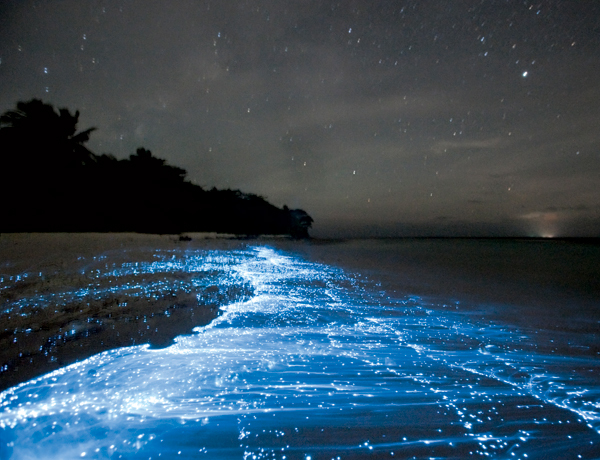 2) After dinner, head down for a stroll by the beach under the stars and be on the lookout for the blue planktons. 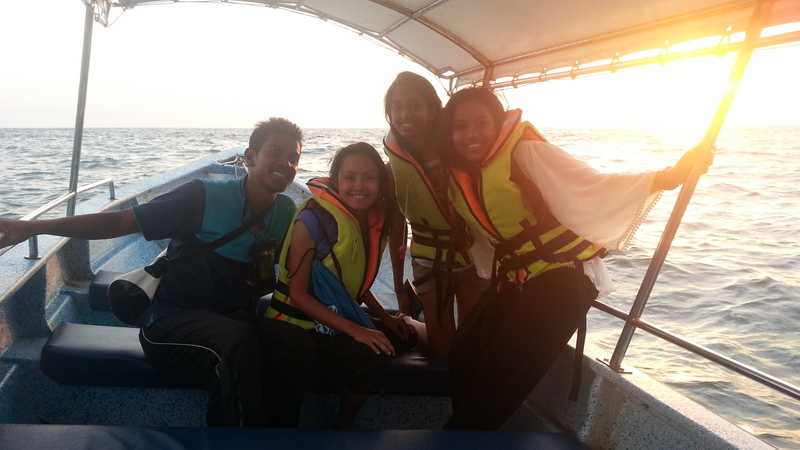 This could easily be your favourite moment in Pangkor. While everybody will be going snorkeling at the same place and doing a boat tour around the neighbouring islands, you can do an absolutely breathtaking private boat tour around the exclusive and privately-owned Pangkor Laut Island, followed by sunset watching. 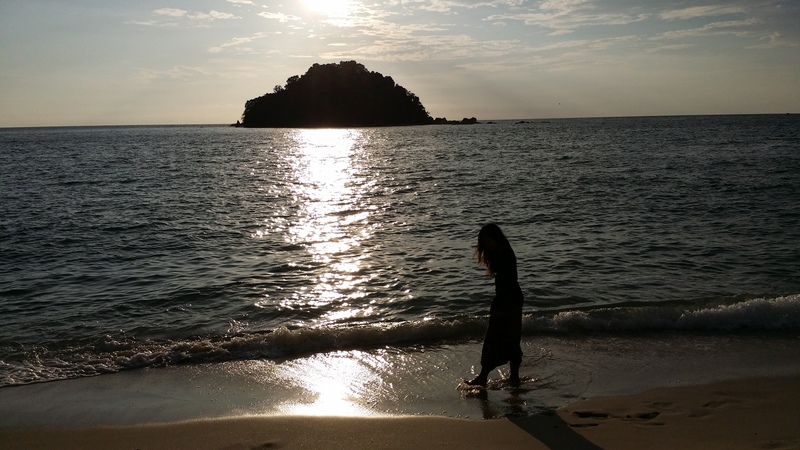 Everybody else will be watching the sunset from the beach or on top of tortoise hill, you’ll get the whole sea to yourself with Pangkor Laut in the foreground and the sunset as your background. Boat tour around Pangkor Laut is RM200/USD61 (after negotiation and a little bit of lady charm). 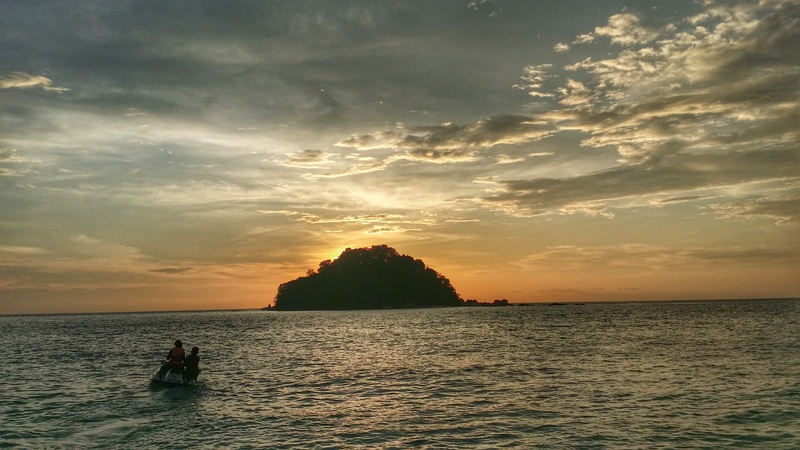 A good guide for this sunset tour will be Musa from SF Watersports which is located at Pangkor Village Beach Resort, Pasir Bogak. 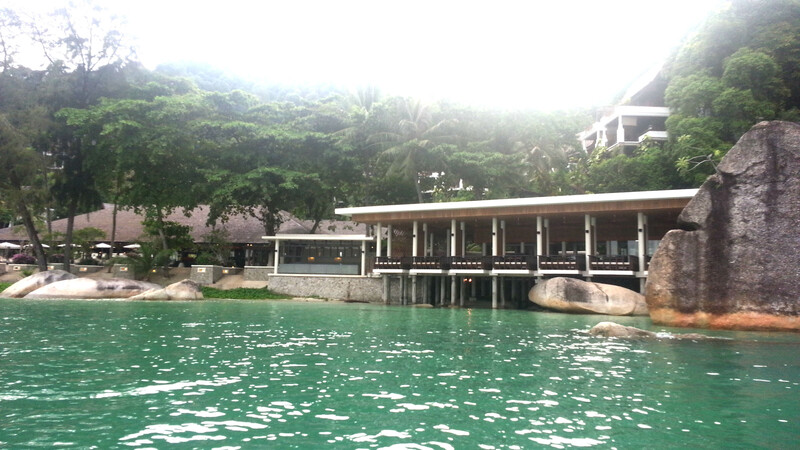 There would be no one on this island that knows about Pangkor Laut more than Musa. Being an ex-staff from Pangkor Laut Resort, he can you tell EVERYTHING you need to know about the exclusive resort and expensive estates nearby. OR you can rent a jetski and jet off to the open sea where it will be just you, the jetski and the sunset (over at Coral Bay, of course). 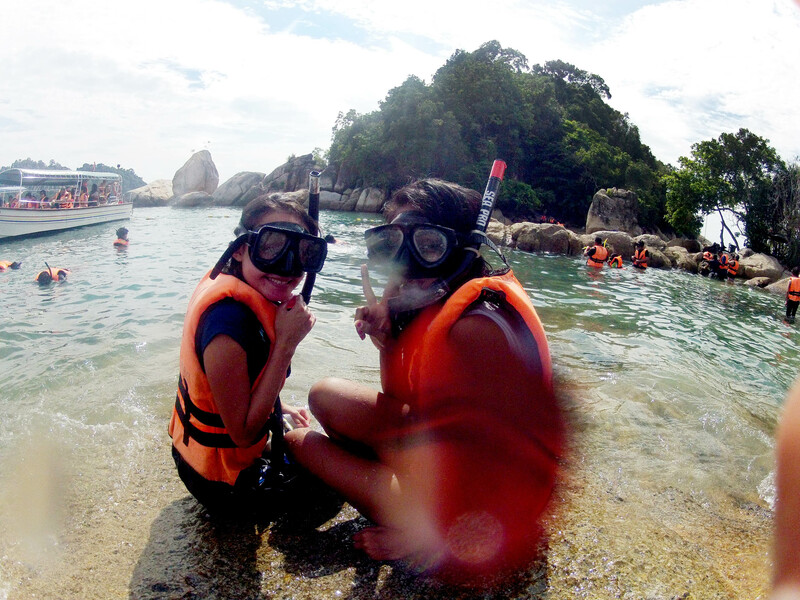 This is my third time to Pangkor Island and each time, Pangkor brings me great surprises and adventures. It never fails to surprise. However, the next time I come to Pangkor, I will bring my adventures to Pangkor Laut and experience for myself the exclusivity of the enchanting Pangkor Laut Resort.